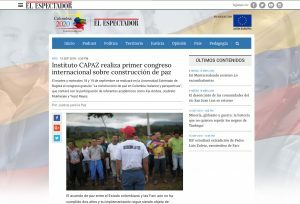 The daily Colombian newspaper El Espectador hightlighted in his recent online edition the first CAPAZ International Conference in Bogotá “La construcción de paz en Colombia: balance y perspectivas” with the participation of academic references such as Kai Ambos and Yesid Reyes. The conference is organized by the CAPAZ Institute and the German Embassy in Bogotá and will take place on Tuesday and Wednesday 18 and 19 September 2018 at the Universidad Externado de Bogotá. Read the article published by El Espectador Colombia 2020 (in Spanish, published on September 15, 2018).